Identify what the user will gain in exchange for their information. Examples are coupon codes, free trials and discounts. When a user views the offer, they’ll see the information that Twitter will be securely sending to the business: name, username and email address linked to their Twitter account. Unlike other offer pages, the Lead Generation Card has the user’s information already filled in, so they don’t have to enter anything in themselves. In the expanded view of your tweet, your call to action is a button beneath the offer description. The text is customizable so you can make it as generic or specific as you like. The Lead Generation Card streamlines the process of acquiring a potential lead’s information. Beta participants reported deeper connections between the brand and users. The Lead Generation Card may drive down their cost-per-lead for this medium. Twitter has not yet announced a launch date. 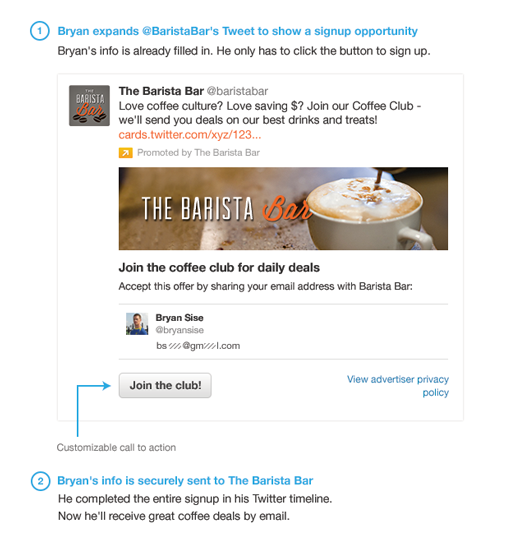 Check back for our follow-up upon Twitter’s formal launch of the Lead Generation Card.